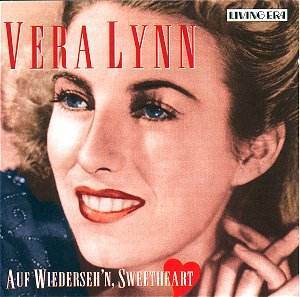 This is a follow up to CD AJA 5464, entitled "Vera Lynn: We’ll Meet Again – The Early Years, 1937-1943". Vera Lynn’s career continued far beyond the 16 years charted here, but the more recent material is of course still copyright. Lynn’s name is indelibly associated with the war years, during which she did a marvellous job of holding up morale in the armed forces through her entertainments. Survivors of those years will need to know only that the transfers are good, with the voice still maintaining a remarkable presence (it was evidently one of those voices which record well), and that the booklet has an informative essay by Peter Dempsey. But what of those who were born rather later? Has she something to offer us or was her extraordinary success more of a sociological phenomenon? I would say that, while so many singers of "light" repertoire from those years now sound irretrievably dated, Vera Lynn still holds her own. By any standards she was a remarkably good singer. Her tone is firm and clear and even, a warm chest voice extended up to the B flat above middle C. She never strains to go above or below her natural range and the sheer ease of her production invites a sort of inner contentment in the listener. She goes easy on the vibrato, which may explain why her voice was so microphone-friendly. Her words are crystal clear, and if the diction is not exactly that of today, there is nothing cute about it. She (and her various directors) has a nice sense of caressing rubato so that potentially soppy songs such as "Be like the kettle and sing" or "Coming Home", which could be terribly sticky in other hands, are genuinely pleasurable. This is also due to her way of combining sincerity with a slight twinkle in the eye. The material itself may be ephemeral, but we can still appreciate how moving a piece like "When the lights go on again" must have been at the time. I could have done with less of Arthur Young’s Novachord, but that is a personal reaction. I venture to suggest that this still remains as a model of how this music should be sung, for anyone wishing to revive it; but maybe it is better still just to stick to the old discs with their unique atmosphere. I think I am right in saying that Vera Lynn’s success was essentially limited to the English-speaking world. Ultimately I suppose her sheer feel good-ness will never make her an international icon such as the far more psychologically vulnerable Edith Piaf, whose voice strikes deeper and more disturbing areas of our own psyches, but she was a shining light and an inspiration to many, and her charm is as yet undimmed.